﻿﻿﻿﻿﻿﻿﻿﻿﻿﻿﻿﻿Gilbert’s daughter, Leatrice, then a young girl, remembered her father greeting her from the top of a long, red-tiled stairway when she arrived for her first visit to his home in the early 1930s. She recalled soft light filtering through high, leaded windowpanes as she climbed the steps. She recalled that one evening at sunset, while they walked up the hillside in back, her father warned her to keep an eye out for rattlesnakes... and Leatrice remembered that from the top of the hill you could see "all Los Angeles out to the ocean" and Santa Catalina Island on the horizon. Leatrice later wrote that it was clear to her even as a child that her father loved the place. When it was built, the first floor of the main house featured an entry area and a large space for entertaining. Blessed with stunning panoramic views, the second floor held the living room, dining room, kitchen, master bedroom and bath. Most rooms were furnished in 17th-Century Spanish reproductions, a style popular in Hollywood at the time. 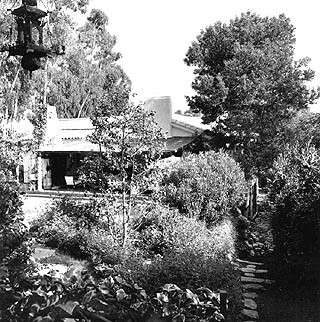 Harold Grieve, a silent-era art and set decorator (Ben-Hur, The Thief of Bagdad, The Sea Wolf) who was a founder of AMPAS and later became an interior designer, worked on the home several times over several years. ﻿The Tower Grove Road property's legend was enhanced with the arrival of its next resident, producer David O. Selznick, in 1945. 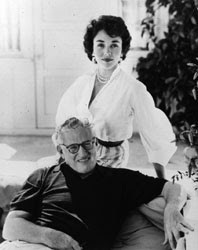 Selznick rented the house when he separated from his wife Irene (L. B. Mayer’s daughter) after he'd become involved with actress Jennifer Jones. Selznick purchased the property from Hopkins just before marrying Jones in 1949. 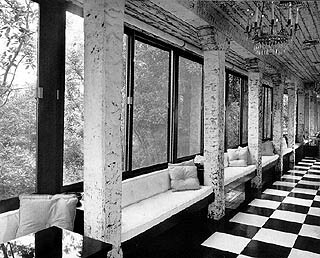 ﻿ Plate-glass windows were installed to dramatize the views and bring indoors the lush beauty of the foliage surrounding the house. Another notable change, the addition of a first floor bedroom/dressing room for Jennifer Jones, featured a striking waterfall just outside her window that could be turned on and off with a switch. ﻿Eight years later, in 1977, hit-maker Elton John bought the house. John’s style was more flamboyant and his taste included Art Deco and Art Moderne (echoes of Miriam Hopkins!). His master bedroom featured a wall covered in mirrors and another covered in ultrasuede. Not too unexpected for a rock star of the '70s, especially one famous for appearing on stage in outrageously over-the-top costumes. 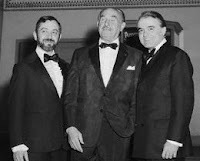 ﻿﻿﻿﻿﻿﻿﻿﻿﻿ In 1981 the house was sold to its first non-entertainment industry resident. The businessman who purchased it had apparently planned only to remodel, but structural problems were uncovered and the building was demolished to make way for an enormous mansion. When John Gilbert lived on Tower Grove Road, other major stars like Harold Lloyd and Jean Harlow lived not far away. 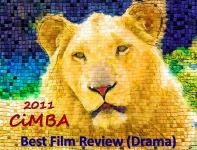 Today Jay Leno, Halle Berry and other 21st Century A-listers reside in the area. thanx eve!! great post and detailed history! 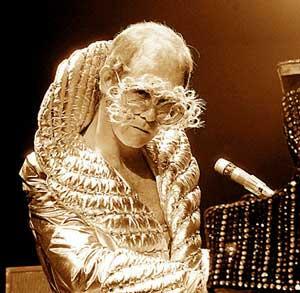 !but..ELTON JOHN...FLAMBOYANT..i don't get it!!lol!! I enjoyed reading the history behind the house that jack built. I tried to overlook the part where Miriam Hopkins lived there, though. Interesting photo of Jennifer Jones and Selznick--for some reason she looks a bit smug. Wonderful piece of history, Eve. Doc, I can imagine John Gilbert rolling in his grave at what Elton John did to the house...and Kim, I guess I might look smug too if I had a personal waterfall! Of course, my tastes would have demanded that I leave the house exactly as Jack built. I hope nobody was dumb enough to get rid of the secret entrance to his private speakeasy! It still amazes how MUCH money these people made. I love my classic actors and actresses, but the flippant use of that kind of income in totally redoing what was probably a fabulous house in the first place always kind of rubs me the wrong way. I'm no socialist, but there has always been such need in our country, and even if I were rich, I'd have a hard time justifying complete indulgence. But then that's me. Eve, as always I loved hearing what Leatrice had to say about her Dad's house. She loved him so. I wonder if Jennifer Jones felt smug. I guess she could have, for a while at least she was 'queen of Hollywood' as Mrs. David O. Selznick. I've always wondered, though, how she managed her conscience over Robert Walker. Then later, in the 1970s, her daughter committed suicide. 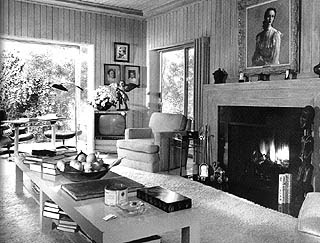 A note about the picture at the bottom of the blog of the Selznick/Jones study, look closely and you'll see a portrait over the fireplace, I believe it's from PORTRAIT OF JENNY. Thanks for the comments, all...I'm wondering how Gilbert would've felt about Elton John's residence - he had been a wild one himself, so he may not have minded...and Kim,not a fan of Miriam Hopkins...or Art Moderne...or? This is a lovely tribute to John Gilbert and a fascinating story of one home’s history and Hollywood connections. 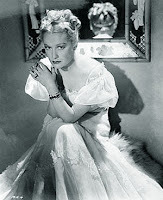 I knew that Elton John had been the last owner of Gilbert’s home, but I was unaware that Miriam Hopkins, as well as David O. Selznick and Jennifer Jones, had also called Tower Grove Road home. I find it touching that Ms. Gilbert Fountain was invited to visit the home where she shared many of her happiest memories with her father. Her descriptions of the home give such a sense of her father and the Hollywood landscape of the time. 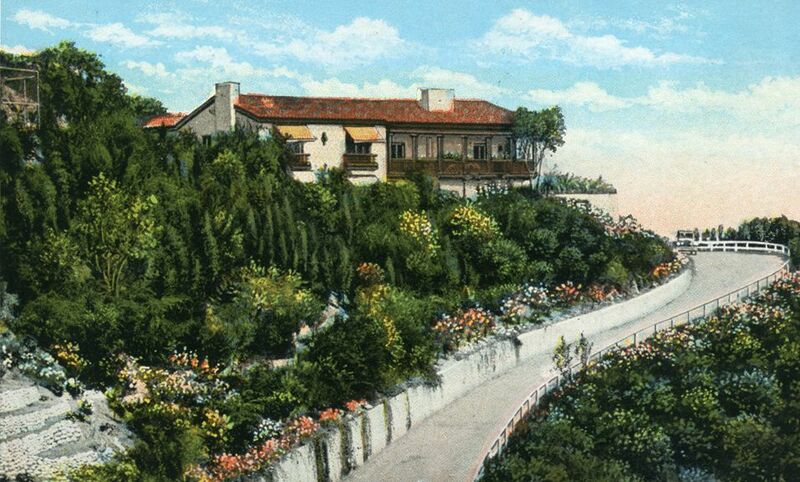 I recently came across a listing for Norma Talmadge’s home, and I found it a bit sad that there is absolutely no hint of the lovely California style villa that appears in the watercolor postcard. 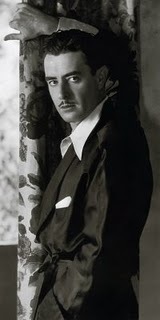 Ladyeve, What a wonderful article about John Gilbert and his beautiful home. That is quite a colorful cast of characters, who lived there after him. What a wonderful picture hanging over the fireplace. I just read an article about, Gene Tierney's childhood home, up for sale. I posted the newspaper article on my Gene Tierney page, if you are interested in checking it out. Eve, what a fascinating account of an incredible house. I always wanted a house with a "secret passage" (apparently, I'll never get one). It was sad to read that such a breath-taking abode has to eventually be demolished. I saw the portrait of Jennifer Jones on the Seznick wall and immediately thought of "Portrait Of Jenny" - I believe it is the same painting (I have a dvd so I'll check to confirm). Interesting, isn't it, that in that film an artist meets his muse who becomes his life-long inspiration (despite their great difference in years) but ultimately turns out to be a phantom, always beyond his reach. In real life Jones seemed to fufill that role for Selznick but, unlike the film, the older man was able to attain her and enshrine his love in John Gilbert's old home - his flesh and blood "Jenny". Art and life seem to blend together in this wonderful old "dream house" with a secret passage and its rich history of fascinating lives - at least when described by you, Eve. Great job of historical research and beautiful descriptive writing. Your article sent me back in time to where I could visualize that gorgeous panorama that Gilbert and his young daughter looked out on all those years ago. I'm sure Los Angeles was a very different place back then - far less crowded and far more innocent. A home says so much about a person - especially if that person has money. Fascinating history.